There is no better way to celebrate nice weather than by taking a relaxing boat tour! North Dakota has plenty of scenic waterways and pristine lakes, making boating a fun hobby for locals and a big draw for tourists. For an unbeatable afternoon on the water, take a trip on one of these seven boat tours in North Dakota. The pearl white, authentic steamship is a merry ship that looks like it came straight out of a history book. The ship cruises along the Missouri River, showing passengers the many beautiful sights along the way! Adventure tours are available from May through September, and the ship is also available for private events like weddings, family reunions, and business events. Reservations for public cruises can be made on their website or by calling the company. 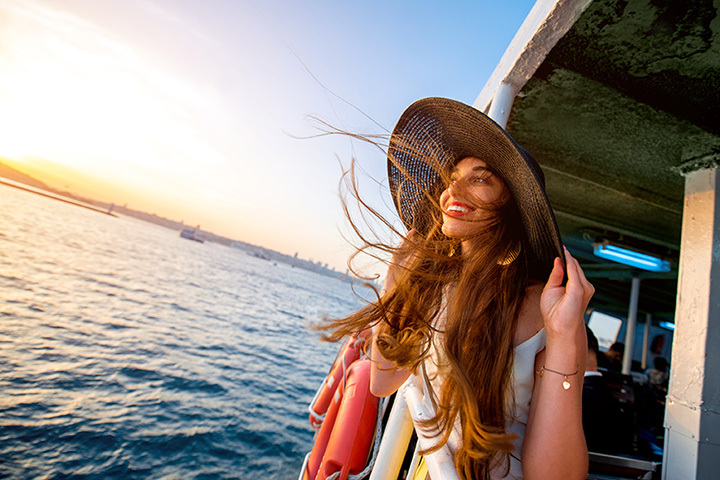 There are also special cruises available, like the brunch cruise, the sunset cruise, the pizza dinner cruise, and many more. The S.S. Ruby is a pontoon boat that offers tours for groups of two to eighteen people. The boat departs from Convent Landing in scenic Iwen Park in Fargo and can go as far north as River Oaks Point or as far south as Wild Rice. Tours are available from May through October, and is also available for custom special events. The rates are very reasonable, starting at only $150, a great deal for up to 18 people! The Garrison Dam on the Missouri River is a big attraction for tourists and locals alike in Riverdale. After all, what is better on a hot summer day that splashing around in the water or going for a cool swim? While not a traditional tour, Tailrace Adventures provides rentals for water activities like boating and kayaking. The breathtaking Lake Sakakawea amazes visitors from land, but the best way to experience this lake is by private boat tour. The elegant and spacious yacht can fit up to 149 passengers, and provides public yacht tours from 1 p.m. to 6 p.m. every Friday and Saturday and from 12 p.m. to 4 p.m. on Sundays. The tour cruises around the huge lake and gives visitors scenic views that can only be found in North Dakota! These public tours last anywhere from an hour and a half to two hours. Private tours and event space are also available for corporate events, weddings, parties, and more. Remember to book your trip at least one week in advance, to ensure availability. For those serious about finding the best fish in North Dakota, Fin Hunters Guide Service is a must. They are the best guide service in the Devils Lake area and have proven their abilities time and time again. But their services aren’t only available in Devils Lake. Guide services are also available in Glacial Lakes in South Dakota, Central North Dakota, Western Minnesota, and the Missouri River system. While Fin Hunters Guide Service isn’t a traditional boat tour, it is a fishing boat expedition that you won’t want to miss! Hooked Up Guide Service is another of Devils Lake’s amazingly talented guides that take guests out onto their boats and show them the ropes of North Dakota fishing. These guided trips mostly focus on walleye, northern pike, and perch, but who knows what you’ll catch! Both full day and half day tours are available. While not a traditional tour boat experience, Boathouse On The Red provides a lake adventure experience like no other! Tourists can rent unique paddle boats and follow a self-guided tour around the lake. Not only is this a great summer activity, but it also provides plenty of exercise. Boathouse On The Red is a must-try while in the Grand Forks area.